Wandering through the Rijksmuseum in Amsterdam around lunch time, I can’t help dwelling on the Old Masters’ ample record of Dutch cuisine in their brilliant still life paintings. The compositions appear so rich in the bounty of the day, and often with prepared dishes that clearly reflect a high degree of culinary accomplishment, surely rivaling what was coming out of kitchens in the other capitals of Europe at the time. Today when we think of French or Italian cuisine, there is an almost immediate understanding of what those broad national categories entail. But what about Dutch cuisine? We are in Amsterdam and clearly there is such a thing. But nothing immediately comes to mind. Why do I draw a blank on a whole nation’s cuisine? One theory put forward by Dutch Food Critic Karin Engelbrecht is that as the colonial might of the Dutch declined and the population growth of the Golden Age tapered off, frugality took hold in Holland. 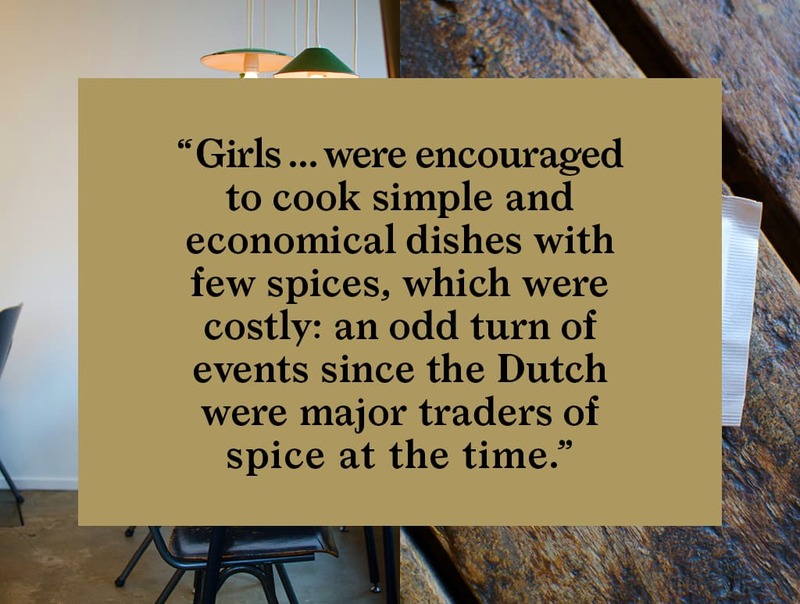 Girls in “Huishoudschools” – a kind of domestic science school which was widely promoted – were encouraged to cook simple and economical dishes with few spices, which were costly: an odd turn of events since the Dutch were major traders of spice at the time. Thus the distinctive dishes that might have developed were presumably suppressed for generations. But no longer. 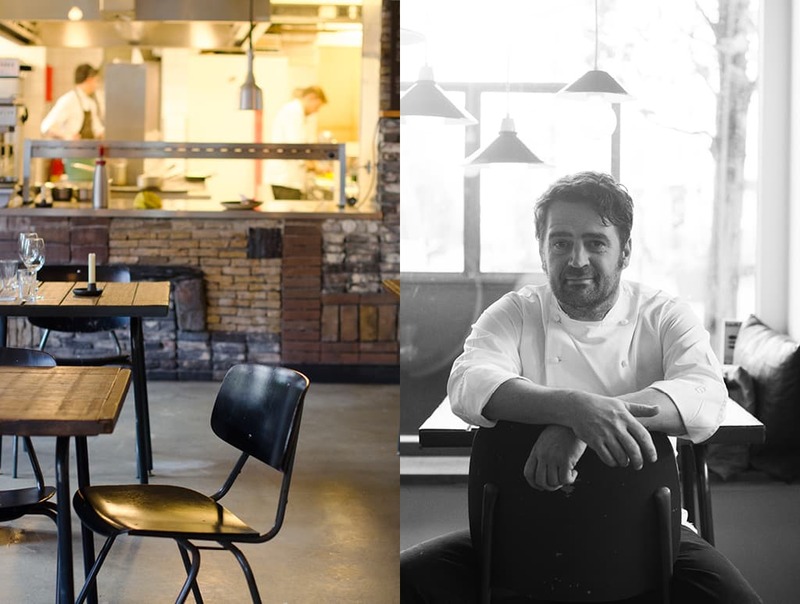 we have heard great things about the chefs of Amsterdam building on Holland’s culinary traditions, so we are excited to get out and educate ourselves on the current food happenings in Amsterdam. 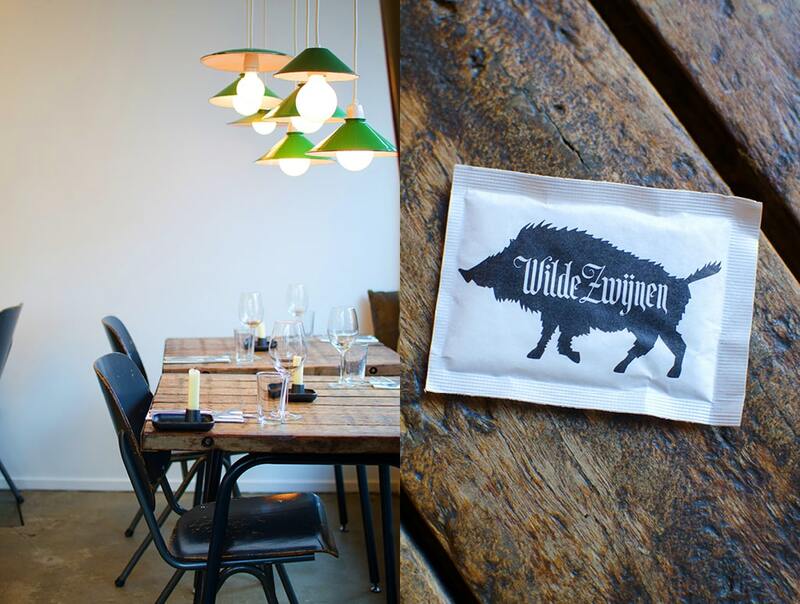 Hopping on a streetcar towards the Oost district of Amsterdam, we are headed for the restaurant “Wilde Zwijne” or Wild Boar. 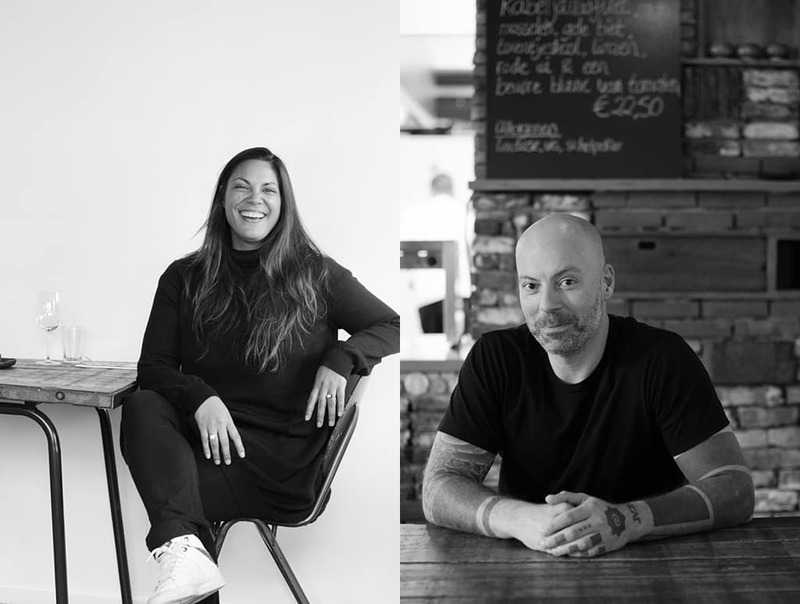 Restaurant owner Julia Bachrach meets us at the door and introduces us to her partners, Faysel van Thiel, and Frenk van Dinther, who is in charge of the kitchen. 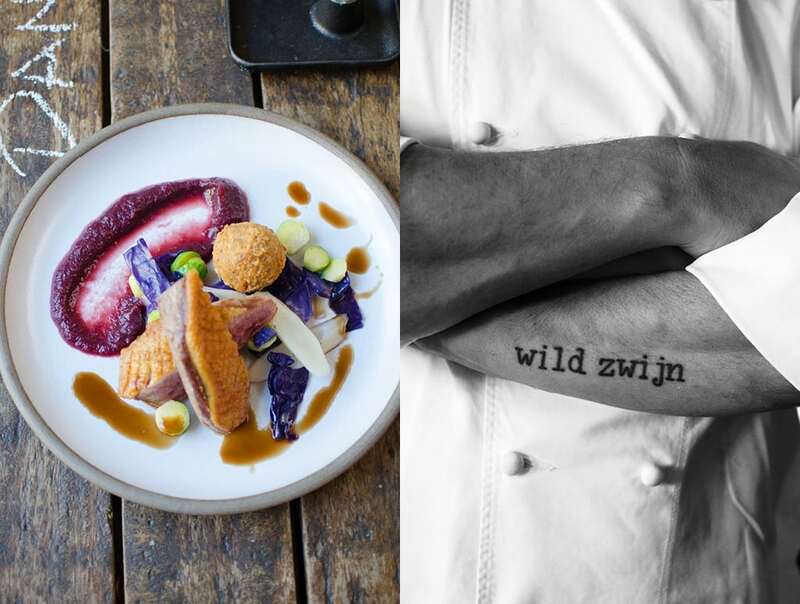 The dishes at Wilde Zwijne are all rooted in Dutch tradition, but each is remade with a new idea or special twist. To start with, Bitterballen. It’s such a classic local delicacy so ripe for reinterpretation. Frank serves his with duck and red cabbage making for a great dish with obvious Dutch origins. Or is it duck with bitterballen? Either way the combination tastes as good as it looks. 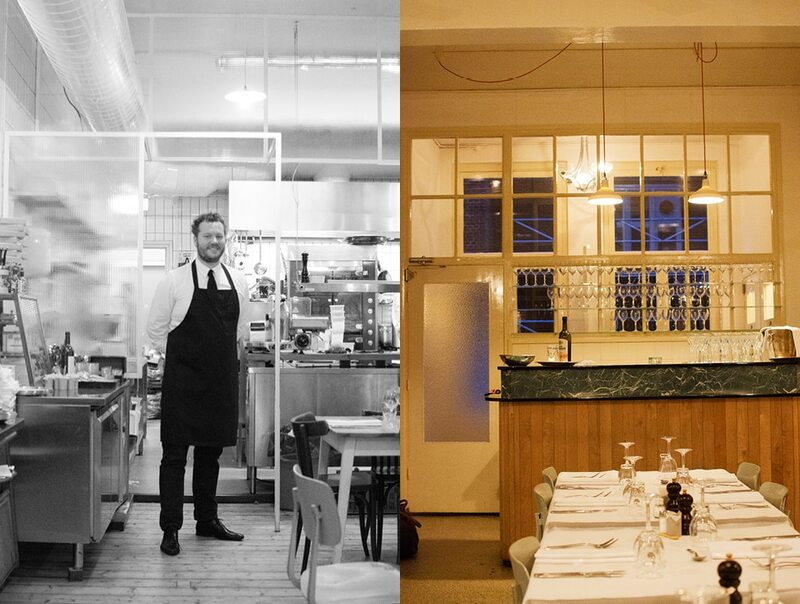 The menu changes daily with what Wilde Zwijne’s small local food purveyors can supply. As Frank says it, his suppliers are really in charge of his daily menu. I appreciate that Wilde Zwijne knows when to just let the food speak for its self. Frank composes a plate of fabulous cheeses from an island in the north of Holland, called Texel. A selection of tough, full-bodied Gouda-like cheeses, the tastes of which harken back to the terrain and flora of Texel. 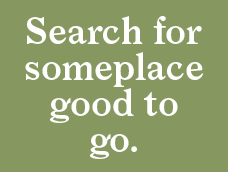 I like the idea of using food to take a virtual trip. Julia says that before starting the restaurant she, Frank and Faysel spent a summer running a food cart together to see if they could all get along in close quarters. 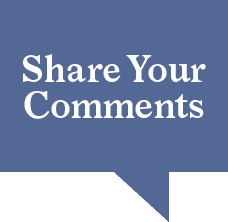 A wise move I think and the experiment seems to have resulted in an affirmative “yes”. There is a tangible team spirit that works, all the way down to the food on the plate. 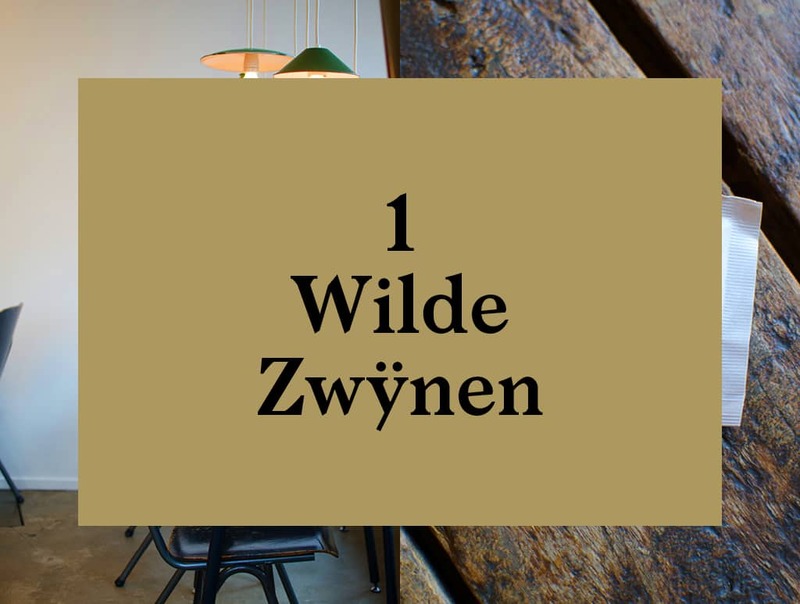 Looking forward to our next visit to Wilde Zwijne and also to Julia, Frank and Faysel’s new venture, “Eetbar”, a Spanish inspired Bar/Restaurant next door. The De Pijp, is a popular neighborhood with working-class roots just outside the Amsterdam’s center. It is an area of popular street markets with a diverse multicultural population, which has become a popular destination for the young and creative to live and hang out. 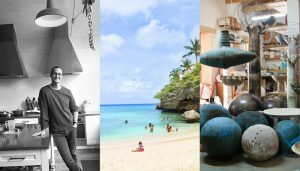 We have come here to meet Aubrey Kriel, a French transplant who arrived in Amsterdam by way of Australia and New Zealand after a career in marketing. 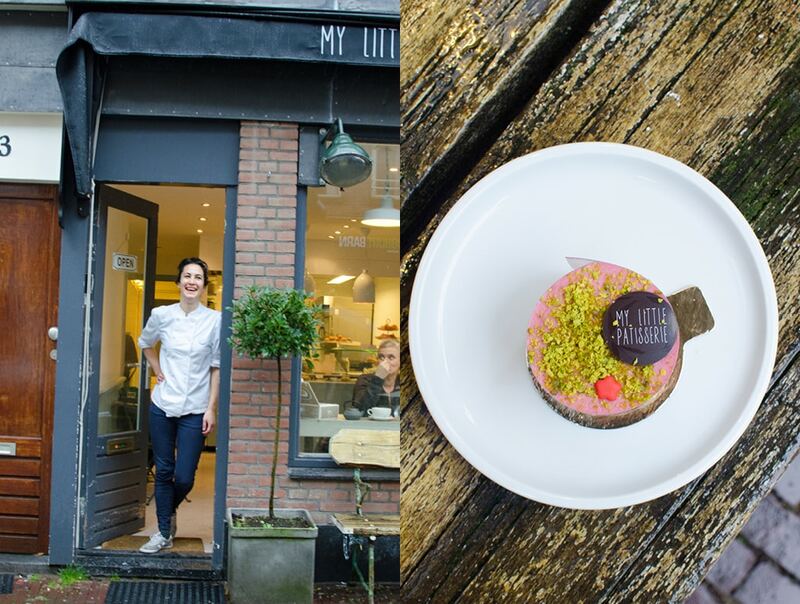 After giving up her desk job she enrolled at the Ecole de Boulangerie in Paris and apprenticed at several Patisseries in Paris and Amsterdam. 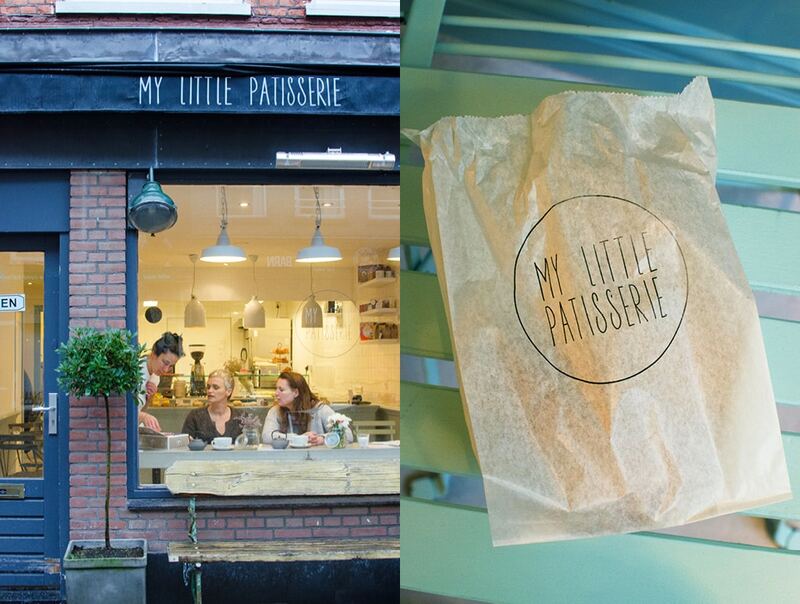 Having opened the aptly named “My Little Patisserie” in early 2015, Aubrey now serves her treats to the inhabitants of De Pijp. Aubrey’s passion is cream-filled pastries and her Eclairs have a loyal following. 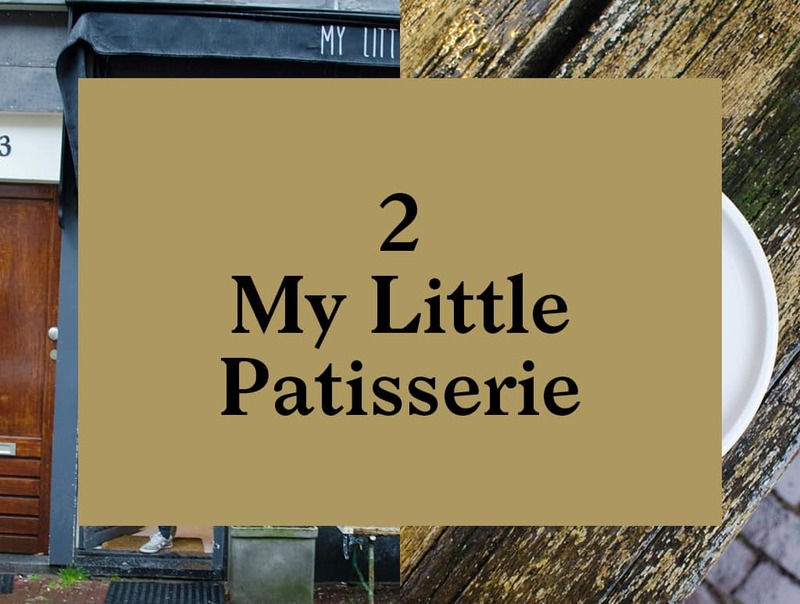 She bakes on-site every day in small batches. Pastries fill the display cases throughout the day from a small glassed production area behind the counter. 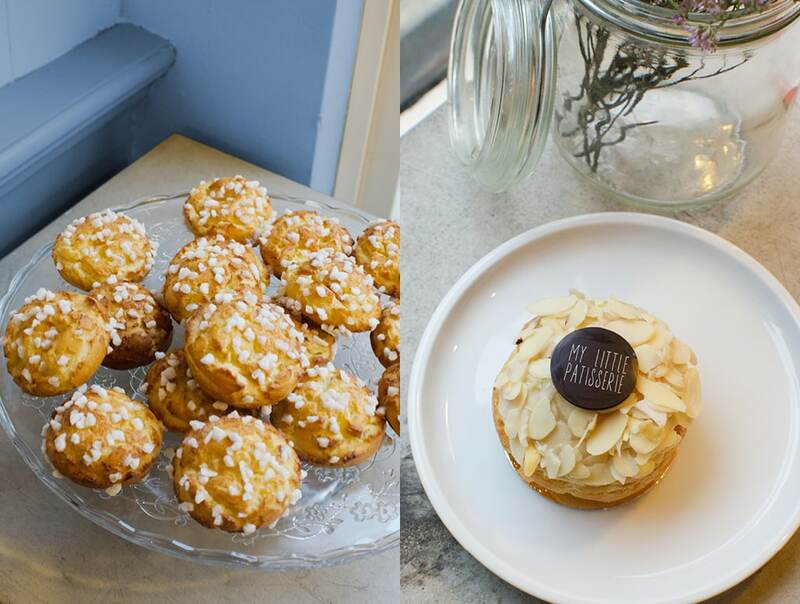 Along with a coffee, freshly brewed by Aubrey’s chosen local roaster, Lot Sixty-One, take a break and have one of My Little Patisserie’s treats to keep yourself nourished while exploring the neighborhood. 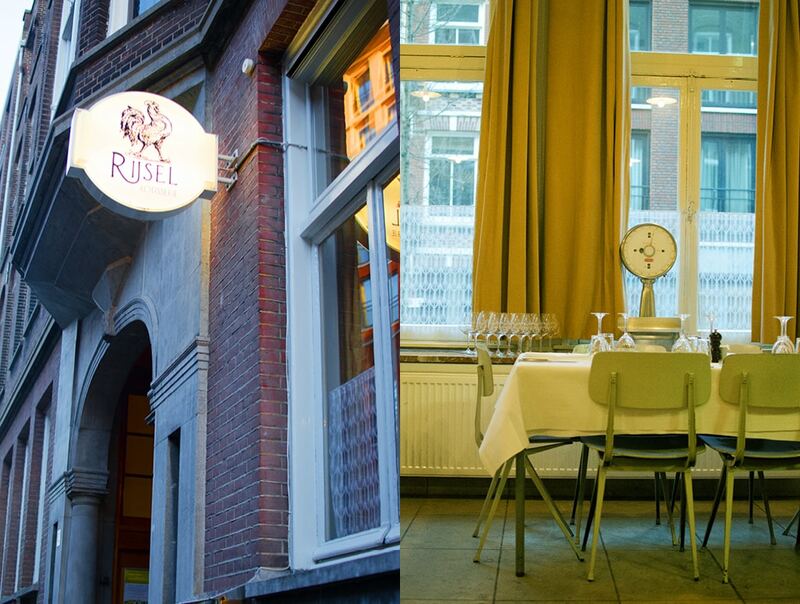 Heading back to the Oost area of Amsterdam, we meet Pieter Smits and chef Iwan Driessen, owners of the restaurant Rijsel. Rijsel is a Flemish slang term for the city of Lille, capital of the region of Flanders. 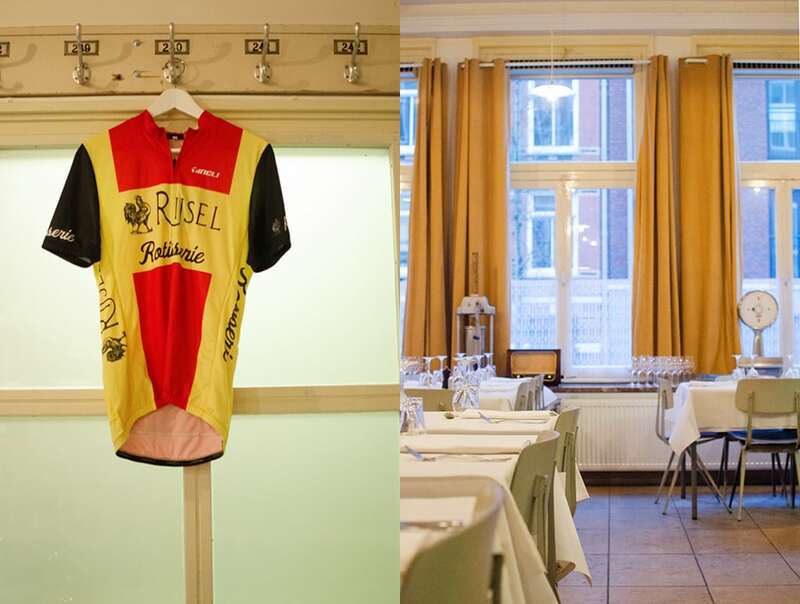 And it is the classic cuisine of Flanders that is Rijsel’s specialty. 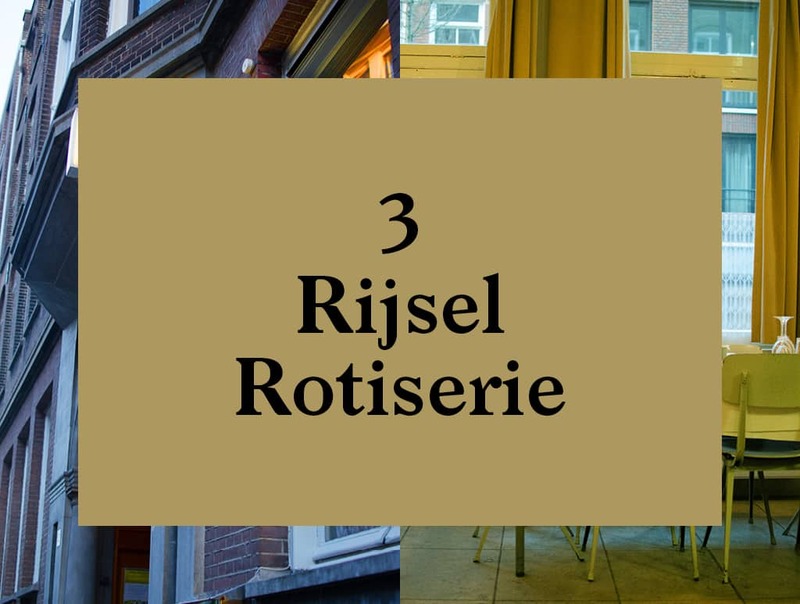 The menu at Rijsel is compact and changes often, except Rijsel’s very popular Rotisserie chicken, which is often on the menu, due to popular demand. We suggest a glass of Cremant before digging into your Rotisserie chicken meal. And the rest of the wine list is well curated and a great value, so expect to choose from some good options. 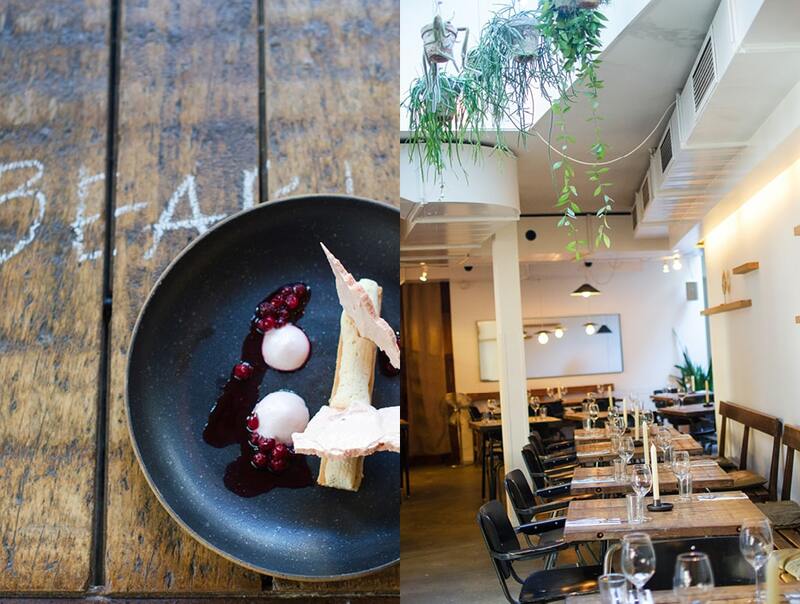 A Dutch journalist coined the phrase “Nouveau Ruig” or New Rough to describe the new crop of restaurants, opened by men with beards in plaid shirts in shadowy alleys at the edge of towns where space is cheap. The typical character of these places is industrial and cozy with no frills. 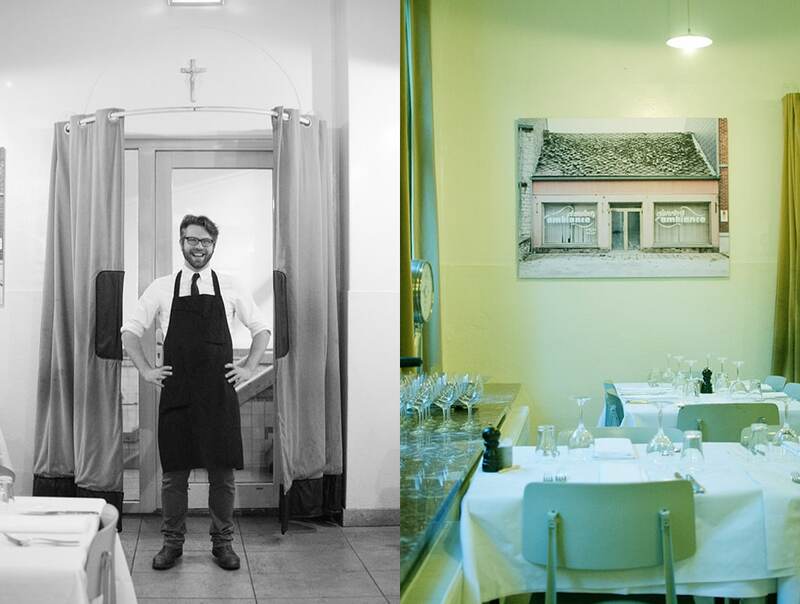 In most regards Rijsel fits the “Nouveau Ruig” characterization to a T. Housed in a former domestic science school, the space has co-opted the school’s ‘60s-era kitchen and dining room with minimal changes. Even the furniture and various pieces of old equipment scattered about are reminders of the room’s earlier educational use. 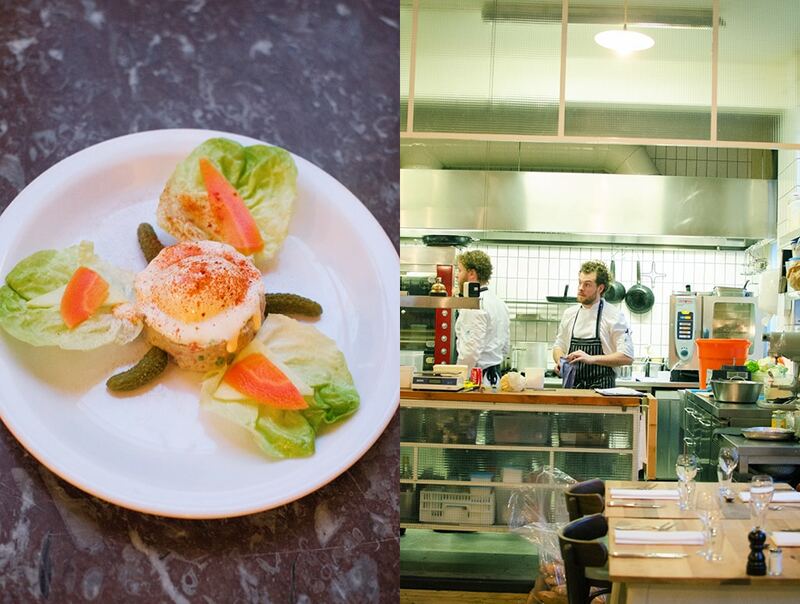 A cozy place with great food, a perfect place for a leisurely dinner with good friends. 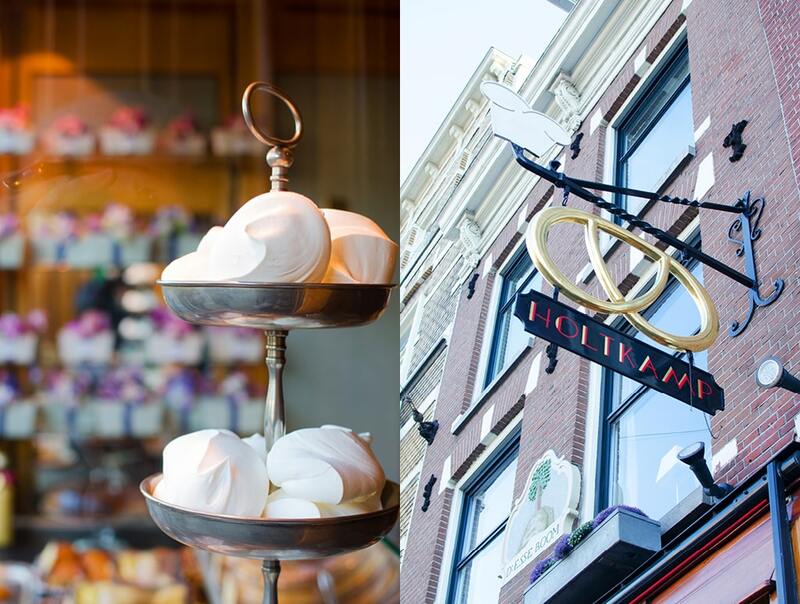 A staple on the Amsterdam food scene since the 1960s, this small wood-paneled patisserie shop is legendary. 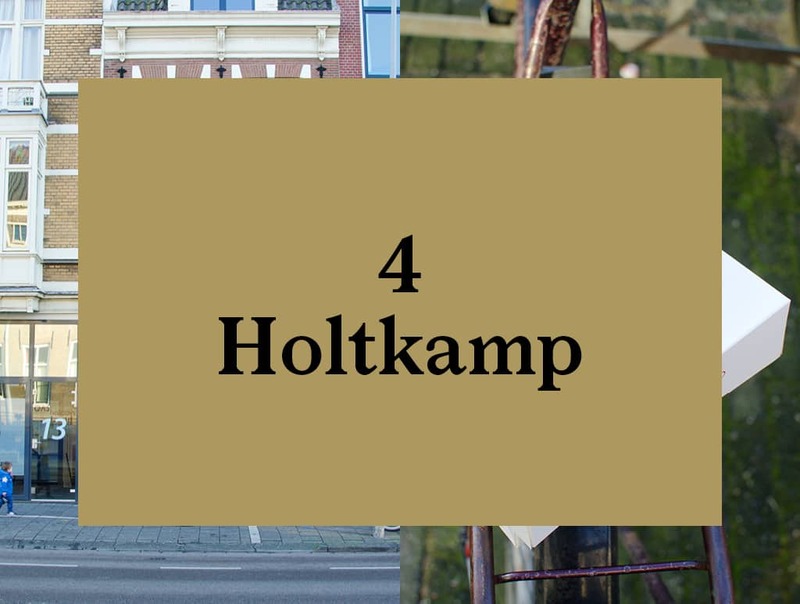 Speak to anyone that spent any length of time living in Amsterdam and they will regale you with fond memories of Holtkamp cakes for birthday and holiday celebrations. 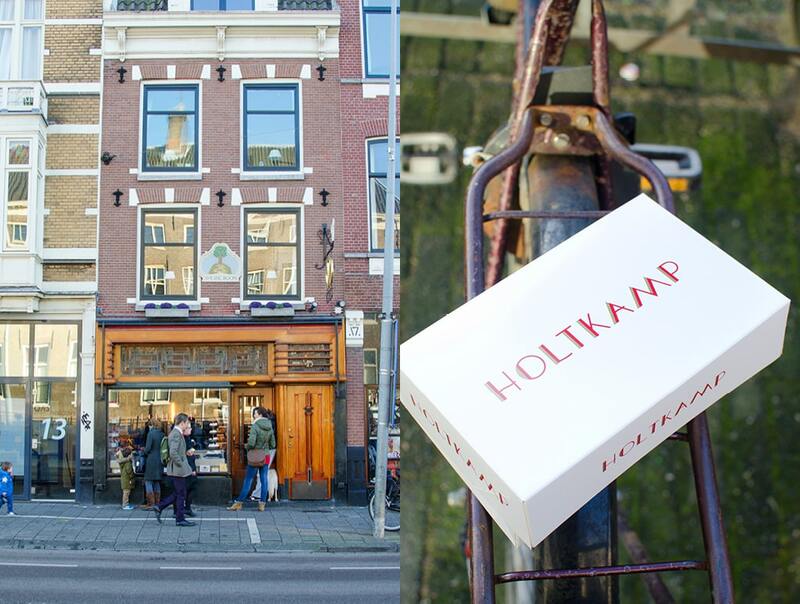 So as the Amsterdamers do … we hop on our bikes and make the short ride to Vijzelgracht 15. The line is already out the door and cake pickups for weekend celebrations are in full swing. We join the line, jostling for space as we gradually move closer to the counter to order. Our appetite increases by the minute while we peek through the window at all the yummy items on offer. It is early, so when we order croquettes we get some funny looks. 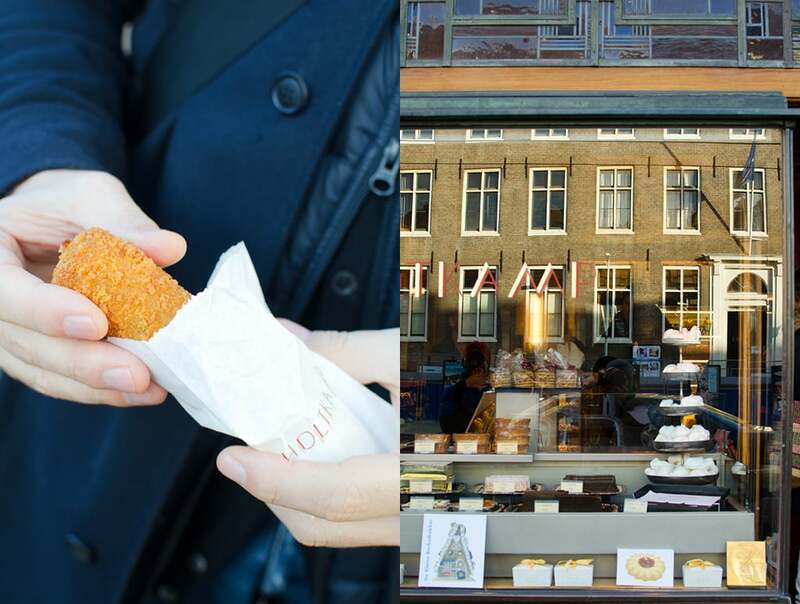 Croquettes are more an afternoon treat so I am afraid we have just outed ourselves as tourists. Seeing the confusion in our eyes, the busy lady at the counter suggest we try one of each of the varieties available – I think she’s trying to head off any time-wasting indecision on our part. 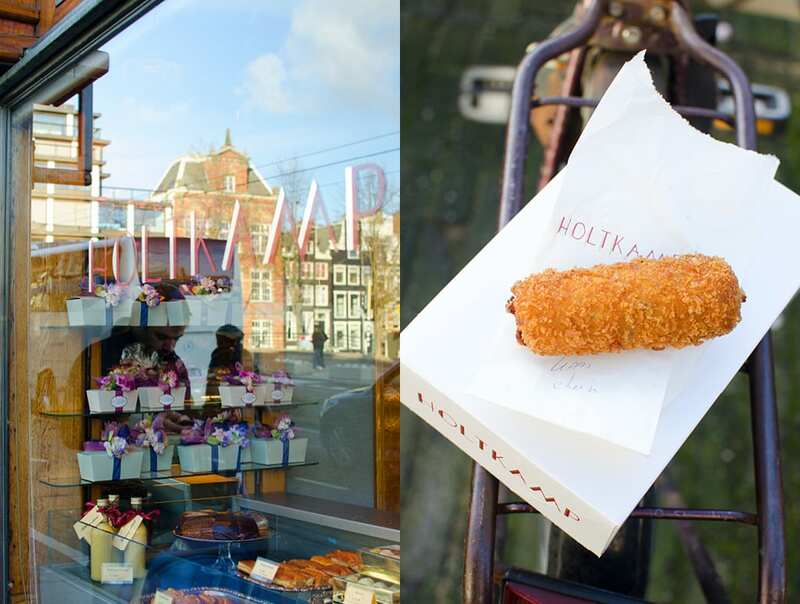 Soon our salesperson reappears with cheese, veal and shrimp croquettes carefully wrapped to go. Back on our bikes, we find a nice picturesque spot overlooking the canals to enjoy our warm little treats. The only disappointment, we didn’t order enough! Next time we will know better and order some cake, too. 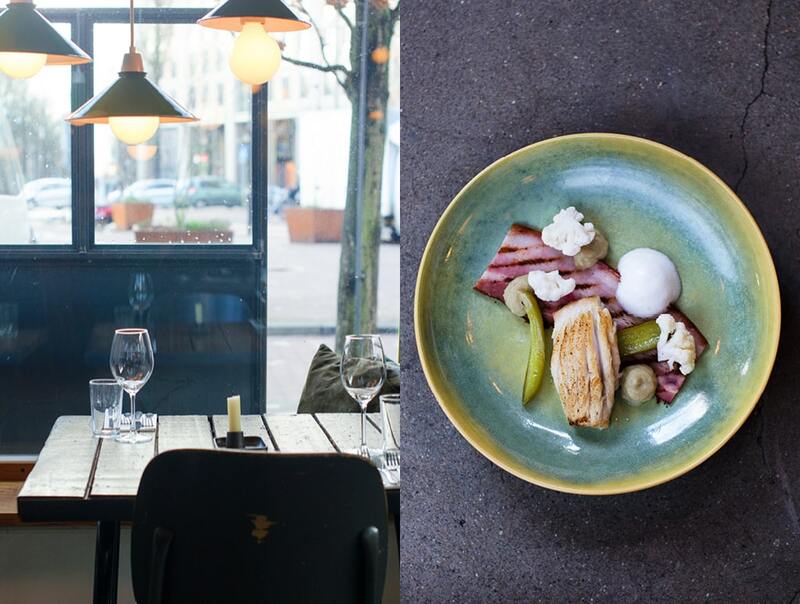 Planning a trip to dine in Amsterdam? Here is the current weather and what to expect for the next few days.